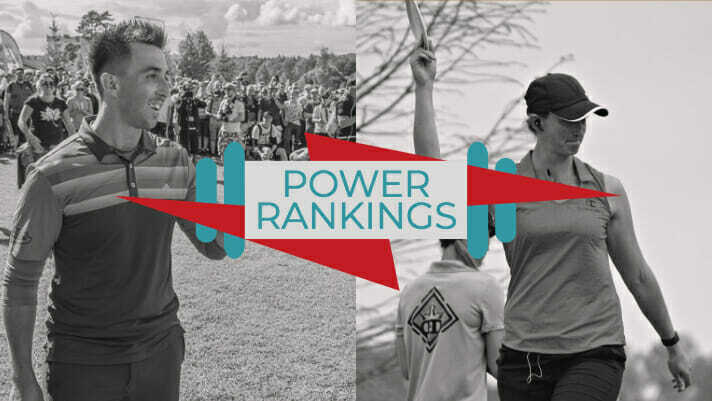 After dominating the headlines for off the course reasons this week, Paul McBeth remains at the top of the year end Ultiworld Disc Golf Power Rankings for his continued assault on the podium (Disc Golf Pro Tour Championship excluded). The late tournaments also saw the top tier of players on the MPO side almost flip, with Kevin Jones, Chris Dickerson, and James Conrad making the biggest jumps up the rankings. And what has become commonplace in the FPO rankings, we see another change at the top of the chart. Sarah Hokom used a couple consistent showings and a win at the DGPT finale to retake no. 1 from Paige Pierce who fell all the way to third. Catrina Allen says her return to the gym helped her game, and it was definitely on display when she dominated a loaded field at the Hall of Fame Classic for her second PDGA National Tour win of 2018. Two top five showings to close out the year, including a long range putting clinic at the DGPT Championship, give Jessica Weese momentum moving into 2019. You wouldn’t think that playing on lead card for an entire tournament would still excite a veteran like Elaine King, but she was having a blast at the International Disc Golf Center at the HOFC. We haven’t been talking about Jennifer Allen much as she hasn’t been at the major tournaments in a while, but her monster now 1062-rated round at the Arizona State Championship was enough to move her back into the ranks. Ricky Wysocki didn’t compete up to his own expectations this season, and hasn’t won since July, but he also hasn’t finished outside the top ten in that time and his last three tournaments went fifth, seventh, third. You could put a similar storyline on Eagle McMahon’s year. After starting the season on an absolute tear he slowed down, which shows in his fall down the ranks, but is he still the Player of the Year? Florida boys JohnE McCray and Garrett Gurthie both had nice late season resurgences once the tour got south. McCray looked good on lead card at the HOFC and Gurthie was quietly top 10 at USDGC and had some highlights on his home course in Jacksonville. Joel Freeman hasn’t had a finish like his second place at the Las Vegas Challenge again, but a 15th place effort at USDGC, advancing through the DGPT Championship to the semifinals, and a B-Tier win over Joe Rovere last weekend add up. Comments on "Ultiworld Disc Golf Power Rankings: End Of Season [November 2, 2018]"